You may have noticed here at Catholic Sistas that we take our food seriously. On our website here we have recipes you can pull up complete with instructions and pictures on how to make the delicious dish. On Pinterest we have many food boards pinned that you can browse in your free time to whet your appetite and inspire you at the same time. On our Facebook page we do a nightly “What’s for dinner?” thread. We love to see what you are feeding your families! But why are we so interested in food? Studies show us that families who eat together have stronger family bonds, their children are less likely to be involved in drugs, alcohol and tobacco, they are more likely to talk about their problems, and tension at home is likely to be far less. Children who spend time with their families eating tend to get higher grades, have less depression and self-esteem issues, are more self-confident, and have a lower rate of eating disorders. 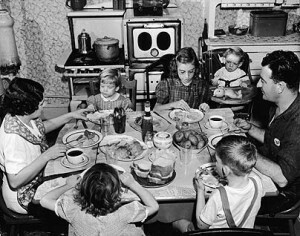 It seems there are so many benefits to sitting down for a meal together so why don’t we make family meal time more of a priority? Often we feel we are just too busy to sit down as a family. We eat on the road to practice or grab something quick as we sit in front of the television after working long hard days. We are overscheduled, overworked, and overburdened. We let other things become more important than what should be important. We want to succeed at work, at school, in our communities, in sports. But if by “succeeding” at all these outside activities we “fail” at coming together as a family, have we really succeeded at all? 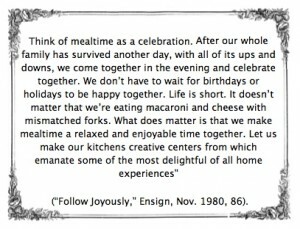 When I think about family meal time I can’t help but think about the Mass. Jesus knew that being fed was so important He actually gave us His body and blood to eat and drink. Our Eucharistic meal is the source and summit of our faith! Christ could have easily given us another way to remember Him but He knew that in His own Jewish faith coming together for the Passover meal was of great significance. 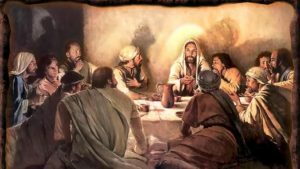 He knew that passing on this meal to us, except now instead of the bread and wine we have His body and blood, would change our lives, increase our faith, and bring us closer to Him! He could have done this in any way but He chose to do so gathered around the table, with the people closest to Him, for a meal. Surely there must be something so worthwhile about coming together for a meal that Jesus Himself instituted the most remarkable and astounding family dinner ever… the Eucharistic feast. If we are to model ourselves after Jesus it seems only fitting that we also place importance on coming together as a family at meals. This doesn’t mean we have to come together at every meal or even at a particular meal every day. It means that if coming together at breakfast works best for our families then we should bond over oatmeal and pop tarts. If we can eat lunch together then grilled cheese and tomato soup can become our bonding agent. If dinner is when we are most likely to be able to all sit down together then taco night can become the best night of the week. The time of day we come together isn’t as important as the effort we make to sit down, relax, and let everyone and everything else in the world fade to the background as we focus our attention on those who matter most… our families. Our children grow so fast. Before we know it they will leave our care and will strike out on their own. I know that they will look back fondly on our time gathered around our kitchen table sharing a meal, laughing, living, and loving as a family. At our table we have taught our children to pray, shown them how to love, built up their confidence, shared in their dreams, and shouldered their sorrows. We have laughed and cried, debated and discussed, lived and loved. Family meal time in our home is special and sacred. Eating a family meal is not just about nourishing and feeding your body; it is about nourishing and feeding your soul as well. If you don’t eat as a family I encourage you to try to make the effort to have at least one meal scheduled together- a meal where nothing else will come in the way… no practices, no television, no meetings, no computers, no outside “noise”. We regularly schedule doctor appointments, parent-teacher conferences, get-togethers with friends; why not schedule a family meal? My bet is that you will enjoy it so much that it will become a regular “thing” at your house. In a world that demands so much of our time and energy it is important that we are the ones who set the rules regarding what is truly important and what is expendable. Our families are not expendable. They are more important than any soccer game, any night out with the girls, any television show that we may want to sit down and watch. They are only here in our care for a short period of time. Make the most of the time you are given. Gather them close, break bread, and share your day, your dreams, and your love with one another.